The embassy of Thailand in Sweden has put out an official travel warning for tourists in Stockholm to be on the lookout for thieves stealing passports and other items. 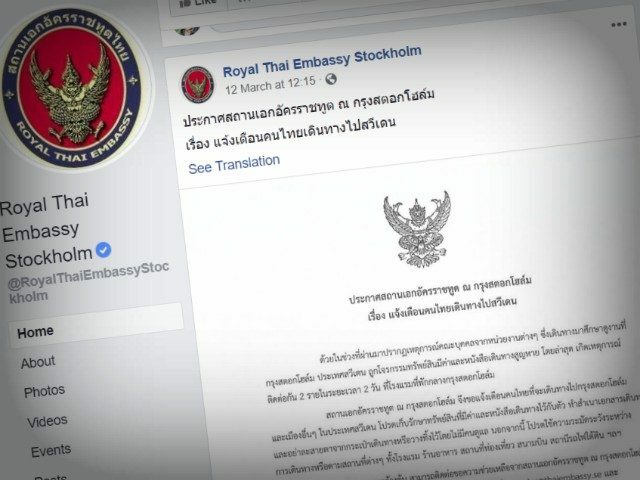 The warning was posted to the embassy’s Facebook page advising Thai citizens not to leave their luggage or other valuable possessions where they would not be able to see them in case of thieves operating in the Swedish capital, Expressen reports. Vonsensey said that several important items were reported by Thai nationals to have been stolen by thieves including passports, money, and mobile phones, saying they were robbed while getting breakfast at their hotels in the centre of the city. Press officer at the Stockholm police Eva Nilsson said the hotel thefts are nothing new but noted the chances of catching the thieves was slightly higher due to the surveillance cameras present in the hotels. The embassy notice comes only months after Chinese tourists accused Swedish police of mistreating them in September of last year which led to the involvement of the Chinese foreign ministry. In December, China issued its own travel warning for Sweden, claiming that Chinese tourists had been involved in at least 40 incidents in three months, including both robberies and thefts.